Marie Lane, from Rake Gate Tenants and Residents’ Association in Grove, Wolverhampton, teamed up with Sue Roberts Wolverhampton’s Councillor. The pair managed to round thousands of pounds in funding to get 50 skips in just for a day to clean up the community. Ms Lane, aged 56, said “Fly-tipping was really becoming a problem so I applied to the Police and Crime Commissioner’s office and we received £5,000. We also used all the money in the residents association account – we’re skint now. It’s so great to see it all clean though, and obviously I hope it stays that way,”. 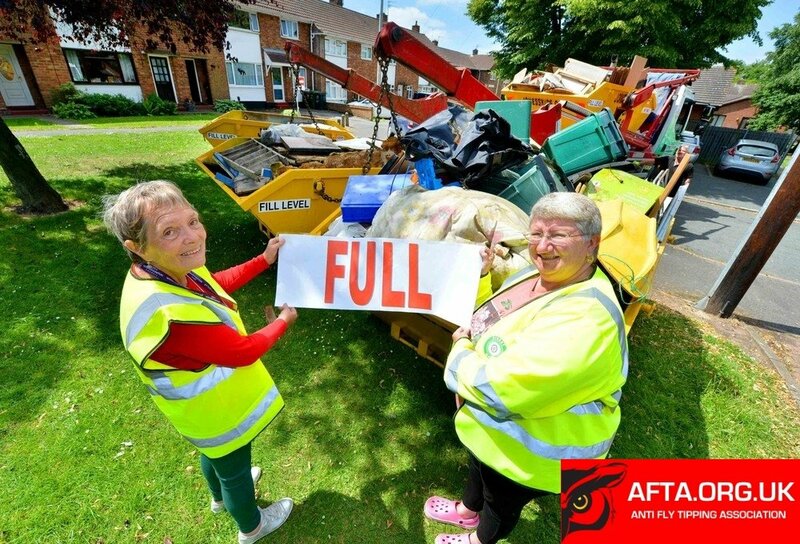 Most residents took part in the clean up last Friday and between them all they managed to fill all 50 skips by the end of the day. Residents and volunteers worked hard until 3.30pm. Ms Lane sent out a news letter explaining what was happening and when. The night before the clear up everyone had a pile of rubbish outside ready to go. Residents say the place looks amazing now and were taken aback at the community spirit to clean the area up. The 50 skips were filled with metal, plastic, wood, fly tipped waste and more all of which will be recycled where it can.